The results of the Medlar with Wesham Questionnaire will be circulated to all residents in the next few weeks. The final touches are currently being added prior to printing and distribution. The prize draw winners will be announced at the Wesham Club Day sports and field day event on June 14th at the field to the rear of the Community Centre. There will be 3 prizes of M&S Vouchers: 1st £50; 2nd £25 and 3rd £10. Thanks to all who took the time to complete and return the questionnaire to help the committee to shape the future of Wesham. 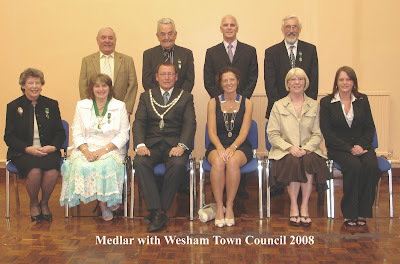 The new Mayor and Mayoress of Medlar-with-Wesham for 2008/09, Cllr Michael Devaney and Mrs Caroline Devaney were installed at the Town Council meeting held on 20th May 2008. Cllr Linda Nulty was installed as Deputy Mayor. The Council wish to congratulate Cllr Devaney and Mrs Devaney and hope they have an enjoyable year in office. 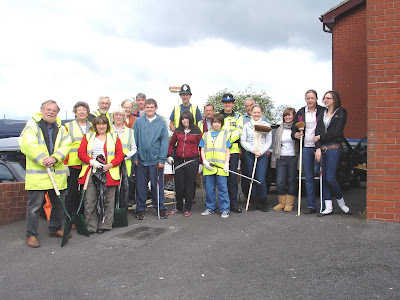 OPERATION CLEANSWEEP >>>> A Big Success! A joint effort of Fylde Borough Council, our local Police Officers, Wesham Town Council and Wesham Community Pride Trust was deemed to be a great success on Sunday morning. Over 20 volunteers responded to the challenge, resulting in the removal of enough rubbish to fill an 8 Ton Skip! The organisers were particularly pleased to see so many young people joining the group who worked extremely hard all morning. 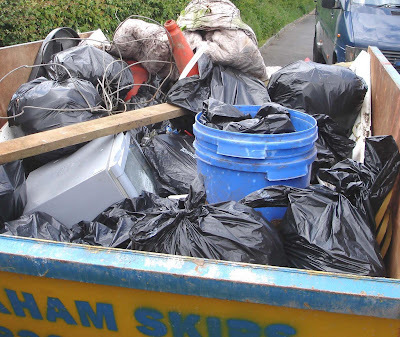 The weather was kind to the valiant team who donned high visibility jackets and gloves to visit almost every road in Wesham including back alleys, removing a variety of rubbish. A good Community Spirit was felt by all at the end of the session, when the evidence could be clearly seen in the 8 ton skip! PC Gary Cross and PCSO Jacqui Marwick had drawn up 6 maps identifying areas for the groups to deal with, and with the help Fylde Borough Officer, Bryan Ward, cleaning equipment was supplied and distributed. After this success, for the second year, plans will be put into place for this to become at least an annual event. Click on aerial picture to enlarge and 'Find your house'! Wesham Welcome The Victorious Return! On a warm sunny evening hundreds of Wesham people turned out to welcome home Kirkham and Wesham Football Club after their win at Wembley on Sunday. 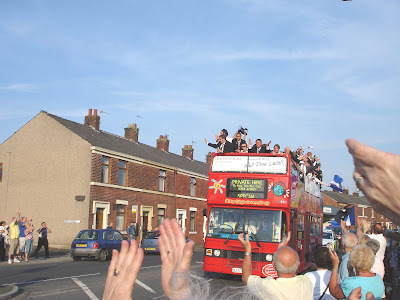 The open top bus then made its' way to Kirkham Community Centre to be welcomed by thousands of well wishers, after which a Civic Reception was held. Presentations were made to the successful team by the Mayor of Kirkham, Cllr Liz Oades, supported by the Mayor of Wesham Cllr David Ogden, to the delight of the supporters. Kirkham and Wesham Football Club win the FA Vase at the Wembley Final. The team will leave Kirkham Market Square at 6.30pm on Monday (12th May) touring Kirkham and Wesham to arrive at Kirkham Community Centre, Mill St, Kirkham for a Civic Reception. 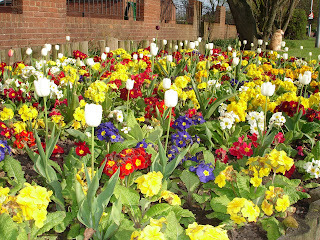 Thanks to Kirkham Town Council, Medlar with Wesham Town Council and Fylde Borough Council for sponsoring the reception.